Data usage has become extremely popular as we all know, but in the fourth quarter of 2013 it became a larger revenue source for mobile carriers than voice usage. In Q3 2013, mobile data revenue grew by 20% year over year (5% quarter over quarter) to $24.8 billion, slightly edging out voice service revenue, according to industry analyst Chetan Sharma. According to Sharma, who predicted the two services would flip in popularity last year, carriers brought in around $90 billion from mobile data plans in the US. 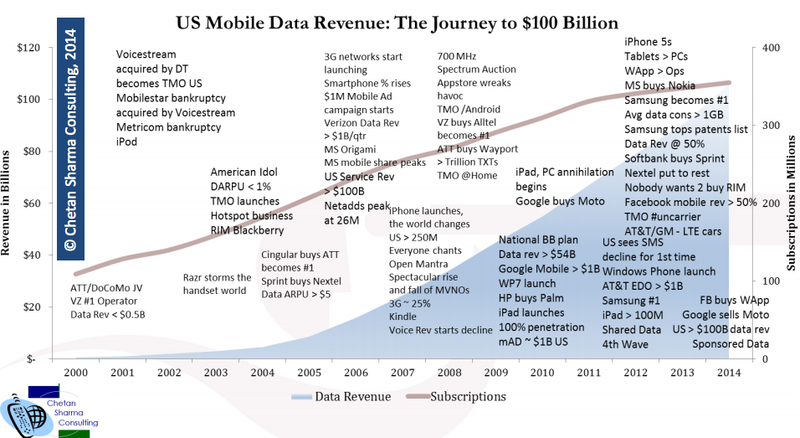 Sharma says that the US is likely to become the first country to hit the $100 billion mark in terms of mobile data plan revenue. Even though the US was the seventh country where data usage revenue beat out voice services, Sharma feels the country will hit the milestone even before places like Japan where data usage revenue already significantly out weighs that of voice services. Based on reports, some are suggesting that data is likely to become the driving force behind the US mobile business moving forward, leaving what was once its bread and butter in the dust. The chart above shows Sharma's predictions for how the US will hit the $100 billion mark along with some history of its growth over the past decade or so.